The custom hangers shown on this page are for viewing only. They were custom made for specific clients and are not for sale to the general public. Let Hot Hang-Ups! make your logo or design into a custom hanger. Hot Hang-Ups! 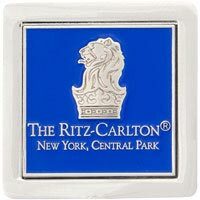 just added the Ritz Carlton Central Park New York Hotel custom logo to our growing list of very satisfied customers! They will using the custom logo purse hangers in their dining room to give that special "ambiance and service” to their female patrons. Thank you for your order Ritz Carlton! !